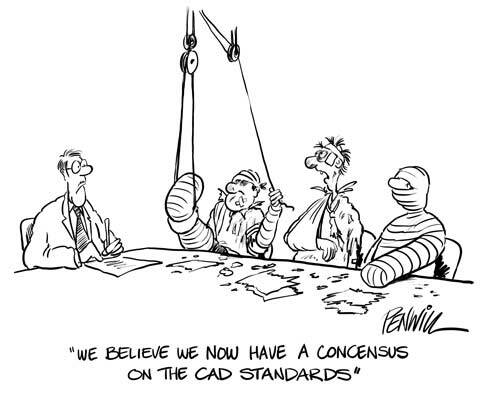 You have found the on-line portfolio of cartoons by Roger Penwill dedicated to those who struggle daily to use, to manage and sometimes even master Computer Aided Design, commonly, and most politely, known as CAD. This collection of cartoons compasses those drawn in the early days of PC-based CAD of the 1980’s up to the present day. All of them are available for reuse in any publication on- or off-line in any medium. New commissions are also eagerly undertaken. All artwork is © copyright Roger Penwill and must not be used without permission.